Adelaide, SA East Coast. 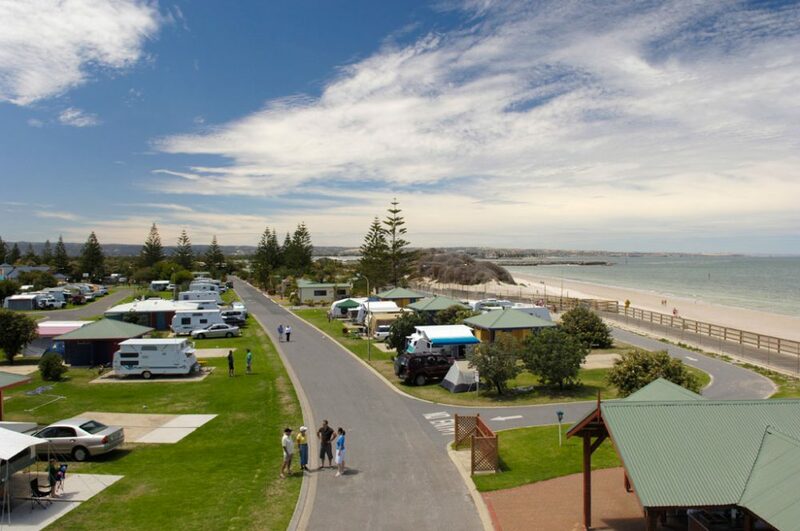 Located on the shores of Adelaide’s West Beach, Big4 Adelaide Shores Caravan Park is in prime position to soak up the beach and explore the capital city. As part of a 135-hectare tourism and recreation reserve, it is surrounded by conveniences such as golf, boating and skating facilities and dining venues. The caravan park boasts a licensed café, laundry amenities, on-site tourism information and bookings, barbecues, bike hire, games room, playground, jumping pillows, heated swimming and wading pools, and a half-sized tennis court. Last year, the park won the South Australian Tourism Award in the Tourist & Caravan Parks category. Powered sites from $36 per night twin-share, Ensuite Sites for caravans from $44 per night twin-share, Eco Tents from $87 per night twin-share, Standard Cabins from $104 per night twin-share, Budget Cabins from $117 per night twin-share, Tourist Cabins from $134 per night twin-share and Executive Cabins from $144 per night twin-share. Superior accommodation options also available.